Congratulations: Who are You Again? Harrison Scott Key, Congratulations, Who Are You Again? A Memoir (New York: Harpers, 2018) , 347 pages including five appendices and no illustrations except an ink figure of a dog drawn by Beetle, the author’s daughter, while I waited for him to sign my book. Over the years I have enjoyed reading memoirs by authors as I learn how they approach the craft and gleam advice for myself. Annie Dillard’s The Writing Life, Eudora Welty,’s One’s Writer’s Beginning, Robert Laxalt’s, Travels with My Royal: A Memoir of the Writing Life, and Dee Brown’s When the Century was Young are books that come to mind. I’ve also read many “how-to” books by authors who tell us how to approach the craft. Without looking at my shelf, I can recall Stephen King, On Writing; William Zinsser, On Writing Well; Ray Bradbury, Zen and the Art of Writing; and John McPhee, Draft #4. All these authors of memoirs and how-to books have an impressive list of publications under their belts when they sat down to give advice on writing. 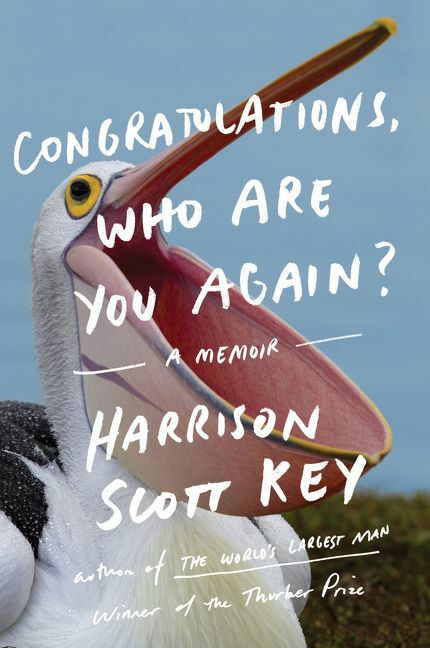 Harrison Scott Key decided he’d write his how-to memoir immediately following the publication of his first book. But then, his first book won the Thurber Prize. The real question is “why, after having read so many books on the topic, I haven’t published a best seller?” I’m not going to answer that and will stick to critiquing Mr. Key’s book. I enjoyed Congratulations, Who Are You Again? even though I am not sure I would have called this a memoir. I’m not sure what it is. Part of the book reads like a “how-to” manual for becoming famous and having a best seller. Part of the book is the author’s quest to discover his life’s purpose as he charges through much of his 20s and 30s like Don Quixote. Part of this book appears to be a sure-fire way to receive a summons to divorce court. Another part of this book is Mr. Key’s depository for lists. And just in case you didn’t have your fill of lists within the text, Key fills his appendices with lists. What is it about all these lists? I was wondering why he didn’t include a grocery list, but concluded that maybe his wife, out of gratitude for now having more than one toilet in the house, has volunteered to shop for the family. But my hunch is that Mr Key’s lists are actually passwords. What a better way to keep them close at hand than to have a book he can pull off his shelf and quickly recall his password for Facebook or Twitter or maybe even First Chatham Bank. And, one final “what is it…” What is it about depressed people and pelicans? Key speaks of his interest in these “freakish and ungainly” birds while depressed. Personally, I find pelicans graceful. A former professor of mine, Donald McCullough, while dealing with depression, actually published a book titled The Wisdom of Pelicans. Like my former professor, I find pelicans graceful, not freakish. I’m not sure what’s wrong with Mr. Key. If pelicans are so depressing, maybe I should give up watching the birds. But that sounds too depressing. That said, this is a funny book. And writing a funny book is one of Mr. Key’s life goals. He’s now achieved this goal twice, first with The World’s Largest Man, and now with Congratulations. Although Key acknowledges his indebtedness to a host of authors, he never mentioned the fabulous 1940 movie, “Sullivan’s Travels,” staring Joel McCrea and Veronica Lake. In “Sullivan’s Travels,” McCrea plays a movie producer who wants to make a movie about the seriousness of the Great Depression in order to move people to respond in compassion. But after a misfortune, he has an epiphany and realizes people also need to laugh. Sullivan learns this wisdom after at the end of the film. Key comes this conclusion on page 49. My third complaint about Key’s writing (In case you weren’t keeping count: #1: Lists. #2: Rude remarks about pelicans) is his overuse of misdirects. Key will begin describing the great things that follow his things such as being published. Following such good news, Key rambles on about all the invitations to TV and radio shows for him to make an appearance. He seems to have a healthy crush on NPR’s Terry Gross. Others ask him to give keynote speeches. He’s also mugged by admirers on Savannah’s streets. Just when the reader is about to believe that there is a god who rewards hard work, the reader is redirected into what really happened. Usually nothing. The exception is an actual mugging on Savannah’s streets. Actually, Key never wrote about being mugged, but it could happen. These redirects were funny the first 57 times this reader fell for this comic technique, but the 58th time was just too much. As I was coming to the end of the book, I thought that if there was one more redirect, I’d rip the book apart and toss it out the window. Thankfully, being near the end, I was reading lists and it’s pretty hard to redirect a reader from one list to another. Who knew lists could be funny? Complaints aside, I thoroughly enjoyed this book and laughed a lot. My biggest take-away from Mr. Key is that writing is like giving birth. I’ve heard that before, but Key attaches his unique twist that refreshes this platitude: “Writing is like giving birth, and it is, it is just like giving birth, in the Middle Ages, when all the babies died.” (114). Writing is hard work, and such hard work in this case produces a book that the reader can easily read and enjoy. And one final comment for clarification. I am not the minister who accosted Keys in a restaurant asking to be included in his next book. Such a request is foolish for if Keys says the things he does about his wife and children, whom he obviously adores, what would he say about a coveting minister. Of course, the minister did find himself in the book, only he’s not identified. What fun is that? This sounds like a great memoir, but I also think pelicans are elegant creatures. I was so excited when they made a come-back from extinction when we pulled DDT from the market. Love the cover of his book! I love watching pelicans fly just above the breakers at the beach at sunrise… they are elegant! Considering where you live, Lee, do they fly just above the waves at sunset? 1) You’re not a vegetarian, so I wouldn’t marry you. 2) Seeing you once a week is too much of a commitment. …It can be fun and therapeutic. Sounds like a creative book. I like it when authors go way outside of the box. oh well you always write good book’s reviews Jeff/Sage. I think in you like Sage. Sorry still is difficult think in you like a Pastor or priest. Is ok.
Hope you vae a nice Advent time, waiting by Jesus ! I hope he didn’t include any lists about pelicans! That would have been the end of it. Haha. I haven’t seen very many pelicans, but I did see some and even take pictures of a few when I visited my son in Florida several years ago. I liked watching them. They’d come around when the fishermen were cleaning their catches of the day. Sounds like a fun book in spite of itself.